On Sunday afternoon, I rocked up to Changlimithang Stadium to do a Taebo workout with 18 pageant queens. The Miss Bhutan 2010 competition is underway and the contestants are involved in many public events during the ‘grooming’ phase of the contest. When I was invited to this Miss Bhutan cardio-kickboxing session, I decided to go because 1) it was the very first Facebook event request I received in Bhutan, 2) it was an opportunity to meet new people, 3) I like Taebo and 4) because exercising on the field at the national stadium sounded like a fun chance. The Miss Bhutan competition will be partly decided via text message votes so the contestants campaign for support during the pageant’s weekly TV time. Bhutan is such a small country that almost everyone I have spoken to here has a sister, a cousin or a niece in the pageant. I am not exaggerating. I showed up at the stadium alone, not expecting to know anyone except the Facebook-only acquaintance who had invited me. I soon bumped into Gyambo who I had met while I was researching at the National Library last week – he has two nieces in the pageant. After a short delay caused by late afternoon rain and a lack of electricity at the stadium to power the speakers, we got moving. I carried a small towel and my Platypus water bottle down to the field, which I bundled up with the cardigan I took off after the warm-up. I also took my point-and-shoot camera, which I tucked into the bundle – I wanted to take a couple of photos from the field. The trainer led the 18 Miss Bhutan hopefuls and about 30 more of us in what was pretty much the standard Billy Blanks Taebo DVD workout. This was good news for me because I could power though despite not having adjusted to the altitude here yet. 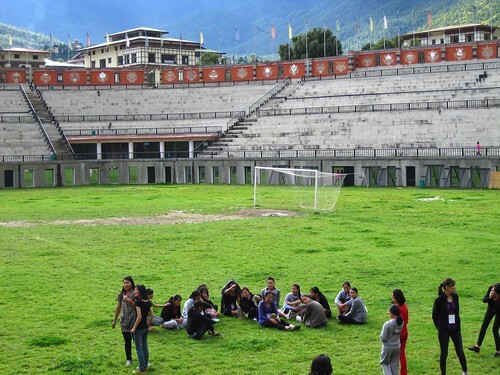 I had been worried that the rugged-soled hiking shoes I was wearing would be too clunky for cardio moves (I didn’t bring gym shoes to Bhutan) but since the grass surface of the stadium is muddy and uneven, hiking shoes were ideal! Once we got into the marching forwards-backwards section of the workout, I grabbed my towel-cardigan-water bottle-camera bundle of stuff and placed it to the side of the group so it wouldn’t get stepped on. It was, at most, five metres to my right. I didn’t even think about its security because there were TV camera people, photographers and pageant officials standing all along the edges. At the end of the workout (which was filmed for TV, by the way. Eeek! ), I was tired but feeling good. I immediately went to get my water bottle for a drink. My bottle was gone from my little bundle of items. My first thought was that some other thirsty person had grabbed it. As I picked up my towel and cardigan, I realized that my camera was gone, too. Firstly, I scanned the grass in case the two items had just been kicked aside by accident. Then I wondered if someone assumed the items were lost and had helpfully taken them back to the stands. Pretty soon, everyone was looking for my camera and bottle. My next guess was that one of the many stray dogs had picked something up. The camera was in a small blue case with a pattern of squirrels which I had bought in Japan. Since there had been three or four TV cameras recording the entire workout, plus several others taking photos, these people started to scan to see if there was anything on record to show what had happened to my stuff. I walked up and down the field: about 75 m away from where I had left it, I found my water bottle in a tuft of grass. I wondered how much further my camera had been carried. Just then, I was called back. There was something to see on the other cameras. The TV camera which had been left to record the entire field view showed a couple of small kids playing around near where I left my things. Gyambo’s camera had an even more amazing image – he’d captured a photo of a tiny, shoeless, ragamuffin girl holding up my camera case and running away. We all had to laugh at the picture – she was 100% caught in the act! The problem was that this small girl was no longer at the stadium. Having seen my water bottle left in the field, I suspected that this three or four year old girl had probably just dropped the camera in its case somewhere. One teenaged guy who had come to join the workout said he recognized the girl in the photo and he knew where she lived. Gyambo drove the teen and me to the house. In reality, it was not so much a house as a tarp-covered shack located on public land, one street up from the vegetable market, where the butcher shops have their back entrances. Gyambo and the teen went to the part of the house where the girl lives but nobody was home yet although it was now dark out. This means that this four-year-old girl wanders around the town alone into the evening. I was feeling like I didn’t want to cause any upset for this family. Who cares about a pocket-sized camera – this family lives in a shack! But the other two weren’t thinking that way and they decided to go check the children’s park down by the river since the girl is often seen there. On the way there, we crossed paths with my friend KD. KD is someone I met here last November and who I’d been in touch with often. 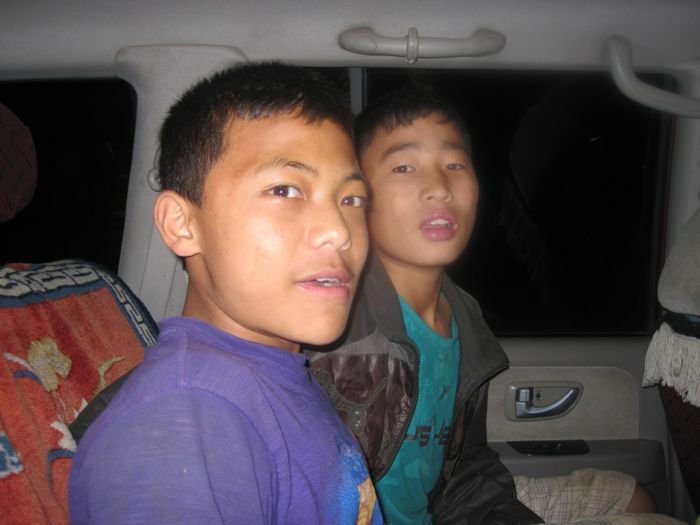 In fact, he picked me up at the airport when I arrived and helped me get settled here. KD took up the case and so the teen and I went with him to the children’s park. The girl wasn’t there. The next idea was to return to the house to wait for her to come back. We found the girl’s grandma at home and so KD explained the situation. I couldn’t understand the conversation but there were no harsh words between them. Not long after, a man arrived at the home carrying the sleeping girl over his shoulder. The street and houses were unlit but from the slants of light escaping from the butcher shops, I could see clearly that she wasn’t carrying anything. The girl was woken up and KD knelt down and asked her very gently if she’d taken something at the stadium that day. Apparently she was quite sleepy but answered that she’d found a camera and had given it to her older brother. The grandma advised that the brother could be found hanging around a drayang in Hong Kong Market where the children’s mother works as a dancer. KD and the teen took off to find him. I sat in the car on the market back street, wondering if perhaps this older brother had sold my camera to someone by now. I watched stray dogs collect butcher shop scraps for quite some time until KD and the teen returned. Apparently the brother didn’t know about the camera. Again, KD asked the little girl, very calmly, about what happened to the thing she had found. A small crowd of kids had now gathered around to hear what was happening. Honestly, by this time, I wanted to drop the matter. It was my own fault for bringing a camera to the field – I didn’t want to get this little poppet in trouble for picking up a case decorated with cute squirrels. 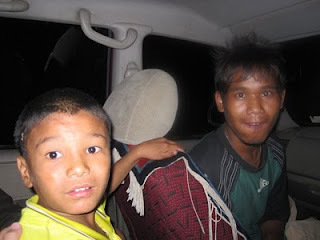 I don’t know if the little girl gave a different answer this time or if another kid had the scoop, but suddenly, three small boys from the market street piled into the back seat of the car with me, and KD and the teen got in, too. Everyone was very excited. Nobody thought to tell me what was happening but we drove back to the children’s park. The four kids and KD climbed a chain-link fence and went into a small hut. Inside, I could see figures walking back and forth. After ten minutes had passed, the five of them hopped the fence again. KD, very proud, was holding my camera. Amazing! There was no case, but I didn’t care. The camera was found! Apparently, the girl who had pulled my camera out of my bundle of things had showed it to two older girls, each about eight years old. They had decided to hide the camera under a mat inside this hut by the park. I’m not sure how KD got this info but he spoke to the girls and had told them that they should return it or he would have to make a report to the police. After conferring with each other, the girls retrieved the camera from where they had stashed it and handed it over. So, about two hours after it had been taken, I had my camera back. I think it’s safe to say that in most other places in the world, I would never have seen it again. I was very grateful to the four kids for all the help they had given. I passed all the cash I had on hand to KD and had him hand out rewards to them - a couple of them were reluctant to accept anything. Here are those four kids who assisted in the camera hunt. Thanks, boys! I was impressed at how kind KD had been when speaking to the various kids and family members and how certain he was that he would get the camera back for me. KD was quite exhilarated at the end of the ‘investigation’ and said he had really enjoyed doing this “CID-type work”, as he called it. I did pout a little when he scolded me for being careless. I honestly didn’t think what I did with the camera was wildly risky. I’d probably do the same thing in Canada. I still insist that Bhutan is a safe country in terms of theft – tiny children, regardless of nationality, can get up to mischief. 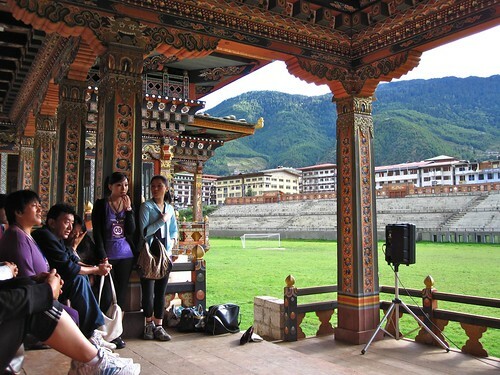 I hope you appreciated the human network here in Bhutan. What a sweet story - I'm so glad you got your camera back! And I'm so impressed about the taebo - you're an inspiration!